1 of 3 Combine soy sauce, sugar, oil, vinegar, ginger, garlic and red pepper in a bowl. 2 of 3 Place ribs in a 5-quart slow cooker; add sauce. Cover and cook on HIGH for 6 hours or LOW for 9 hours, until meat is tender. 3 of 3 Transfer ribs to a platter. Skim and discard excess fat from liquid. Combine cornstarch and 3 tablespoons water; blend with liquid in a saucepan. Bring to a boil over high heat and cook for 2 minutes, stirring, until thickened. Stir in carrots. 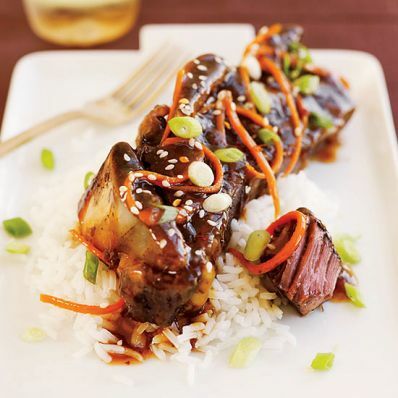 Top ribs with sauce, scallions and sesame seeds. Serve with cooked rice. Per Serving: 8 g sat. fat, 43 g carb., 33 g pro., 92 mg chol., 23 g Fat, total, 829 mg sodium, 2 g fiber, 518 kcal cal.